Each chapter presents a practical problem to be solved, within a project planning framework. The project orientation is strengthened by the use of the Roadmap, which provides a visual guide for the project. Step-by-step instructions with supporting screens guide students through the steps. Instructional steps are supported by the Q&A, Other Ways, Experimental Steps, and BTW features. the student. Callouts on the screens that present both explanatory and navigational information provide students with information they need when they need to know it. The appendices provide additional information about the details of HTML and CSS so that students can quickly look up information about web design terms, HTML elements, attributes, and valid values as well as CSS properties and values. Extensive end-of-chapter activities provide a variety of reinforcement opportunities for students where they can apply and expand their skills. To complete some of these assignments, you will be required to use the Data Files for Students. Visit www .cengagebrain.com for detailed access instructions or contact your instructor for information about accessing the required les. For this edition, the development team made a huge leap forward in bringing up-to-date, forward-thinking website development practices into focus and application. The webpage development process starts with a semantic wireframe, which uses the structural elements new to HTML5 to ef ciently organize the regions of a webpage. Design a single website that responds to the screen displays of desktop and laptop computers, tablets, smartphones, and other mobile devices. The chapter project and exercises incorporate the latest additions to HTML and CSS, including new HTML5 elements, CSS3 properties, and syntax recommended by the World Wide Web Consortium (W3C). 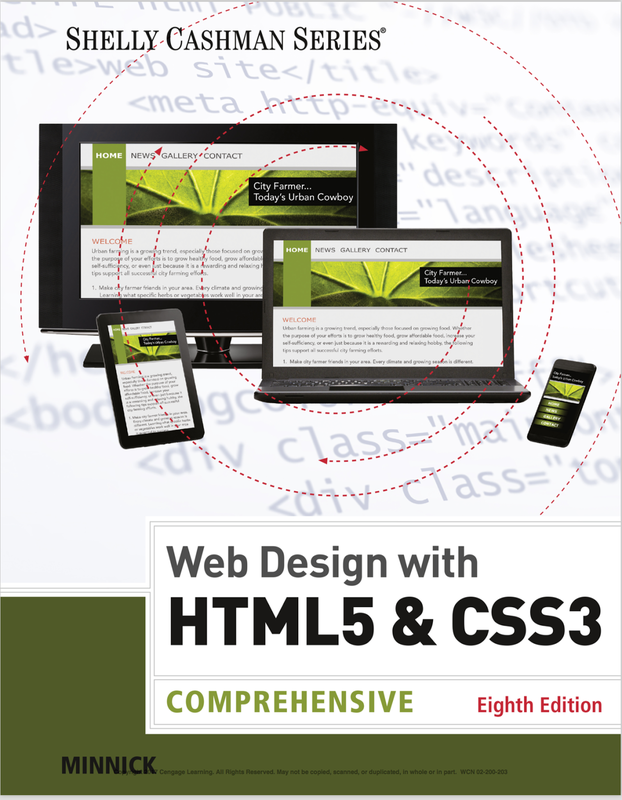 Every chapter validates documents using online tools for HTML5 and CSS3. This edition contains a wealth of contemporary projects that logically build in complexity and probe for understanding. Our goal is not only to help you teach valid HTML and CSS, but to reveal deeper conceptual issues essential to the eld of web development. Using the technologies of today’s web developers results in websites that are worthy candidates for an electronic portfolio. With the advent of today’s powerful content management systems and website builder tools, do you still need to learn how to create HTML and CSS les from scratch in a text editor? Professionals in the eld answer that question with a united, enthusiastic yes! Mastering these technologies is essential to all web-related careers.